How An Appliance Repair Shop Owner Went From Being Days Away From Going Out Of Business To Opening A Second Location In Less Than 60 Days. The story I’m about to tell you is true. The names have remained the same so that you can evaluate the truth for yourself. These are the actual events chronicled over the past 60 days concerning an appliance repair company in Fort Myers Florida and their amazing transformation from a business on the brink of disaster to a company in the process of opening a new office in Naples, Florida. Joe Pose of PoseTek Appliance Services calls me at the request of Tom Kindelan, the owner of Regal Car Rental in Fort Myers, FL. A month prior, we worked with Tom assisting him with his local search marketing increasing his SPLY rentals by 400% for the month of July. After doggedly urging Joe to call me, he eventually did. We agreed to help Joe with his local search marketing. 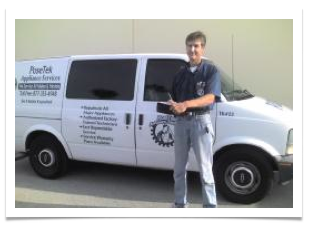 Joe fills-out our comprehensive Local Search Marketing form and informs me that the most profitable aspect of his business is out-of-warranty refrigerator repair, closely followed by washer repair, dryer repair and dishwasher repair. With that knowledge and the information we acquired on the form, we went about optimizing his business listing for those terms. With the keyword research completed and the copy written, we helped Joe claim his business on Google, Yahoo and Bing. We spent the day garnering business citations for PoseTek Appliance on most of the major citation sites. We also taught Joe how to acquire additional citations on local and vertical appliance repair sites. Then we showed him how to generate 5-Star reviews from his customers. Now it was a waiting game to see if our efforts were going to pay off … which we knew they would. I received a call from Joe. He was ecstatic. He received a call from a customer who hired him to do an out-of-warranty repair. She found him on Google. After taking the call, he went to Google to find that PoseTek Appliance was in the number one position on the map for all of the terms we targeted in Fort Myers, FL. You can see an example here. Joe calls to tell me that he is generating an average of one new out-of-warranty customer every day. Each new customer is worth over $200 and he could not be happier. I informed him that Google intends to come out with a new paid service called “Tags” which I believe will help him generate even more business now that he’s on the front page of results. Cost $25/month. Google keeps its promise and releases “Tags” for the state of Florida. We help Joe set up his Tag and wait to see what happens. Joe calls to tell me that he had 6 new customers contact him for out-of-warranty service on that day alone and he received 3 new customers on the previous Monday. His business is doing so well now, that he’s planning to open a new office in Naples, Florida. “Once we get a new customer (that’s the hard part), they become a customer for life. So when I tell you that you’re responsible for PoseTek getting 6 New (Out-of-Warranty) Customers today, you can imagine what that means to us in terms of dollars and additional service calls. And we’re getting new customers at an accelerated rate. As long as you don’t own appliance repair company or a rental car business in Southwest Florida, feel free to call either Joe Pose (239) 200-6669 or Tom Kindelan (239) 566-3643 to hear their story first hand. Want to put this same strategy that transformed Joe’s business to work for your local business? Give me a call here in Hawaii at 808-891-0449 today.